The development of DNA (or molecular) markers has irreversibly changed the disciplines of plant genetics and plant breeding. 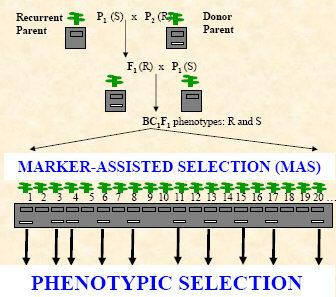 While there are several applications of DNA markers in breeding, the most promising for cultivar development is called marker assisted selection (MAS). By determining the allele of a DNA marker, plants that possess particular genes or quantitative trait loci (QTLs) may be identified based on their genotype rather than their phenotype. 1. What are the advantages of marker-assisted selection? Single plants may be selected with high reliability. (2) accelerated line development in breeding programs. For example, time and labour savings may arise from the substitution of difficult or time-consuming field trials (that need to be conducted at particular times of year or at specific locations, or are technically complicated) with DNA marker tests. Furthermore, selection based on DNA markers may be more reliable due to the influence of environmental factors on field trials. In some cases, using DNA markers may be more cost effective than the screening for the target trait. Another benefit from using MAS is that the total number of lines that need to be tested may be reduced. Since many lines can be discarded after MAS at an early generation, this permits a more effective breeding design. The greater efficiency of target trait selection which may enable certain traits to be �fast-tracked�, since specific genotypes can be easily identified and selected. Moreover, �background� markers may also be used to accelerate the recovery of recurrent parents during marker-assisted backcrossing (discussed later). 2. What is the importance of QTL mapping for MAS? The identification of genes and quantitative trait loci (QTLs) and DNA markers that are linked to them is accomplished via QTL mapping experiments. QTL mapping thus represents the foundation of the development of markers for MAS. Previously, it was generally assumed that markers could be directly used in MAS. However, there are many factors that influence the accuracy of QTL mapping such as population size and type, level of replication of phenotypic data, environmental effects and genotyping errors. These factors are particularly important for more complex quantitative traits with many QTLs each with relatively small effects (e.g. drought tolerance, yield). Therefore, in recent years it has become widely-accepted that QTL confirmation, validation and/or additional marker testing steps may be required after QTL mapping and prior to MAS. Marker conversion - may be required such that the marker genotyping method is technically simpler for MAS or so that the reliability is improved. Marker validation � testing the level of polymorphism of most tightly-linked markers within a narrow window (say 5 - 10 cM) spanning a target locus and also testing the reliability of markers to predict phenotype. Markers must be tightly-linked to target loci! Ideally markers should be <5 cM from a gene or QTL. Using a pair of flanking markers can greatly improve reliability but increases time and cost. 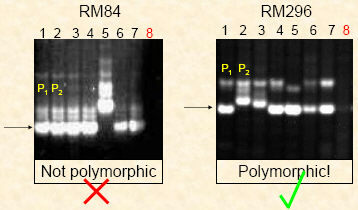 There are three levels of selection in which markers may be applied in backcross breeding. In the first level, markers may be used to screen for the target trait, which may be useful for traits that have laborious phenotypic screening procedures or recessive alleles. 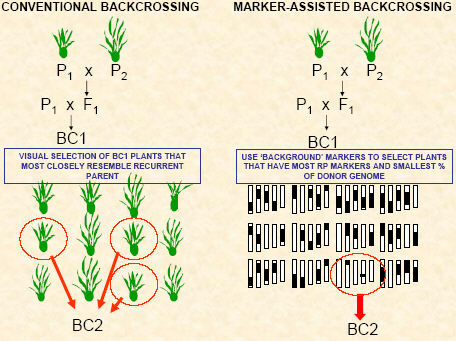 The second level of selection involves selecting backcross progeny with the target gene and tightly-linked flanking markers in order to minimize linkage drag. We refer to this as �recombinant selection�. The third level of MAB involves selecting backcross progeny (that have already been selected for the target trait) with �background� markers. In other words, markers can be used to select against the donor genome, which may accelerate the recovery of the recurrent parent genome. Three levels of selection during marker-assisted backcrossing. With conventional backcrossing, it takes a minimum of five to six generations to recover the recurrent parent. Data from simulation studies suggests that at least two but possibly three or even four backcross generations can be saved by using markers. Pyramiding is the process of simultaneously combining multiple genes/QTLs together into a single genotype. This is possible through conventional breeding but extremely difficult or impossible at early generations. Using conventional phenotypic selection, individual plants must be phenotypically screened for all traits tested. Therefore, it may be very difficult to assess plants from certain population types (e.g. F2) or for traits with destructive bioassays. DNA markers may facilitate selection because DNA marker assays are non-destructive and markers for multiple specific genes/QTLs can be tested using a single DNA sample without phenotyping. The most widespread application for pyramiding has been for combining multiple disease resistance genes in order to develop durable disease resistance. Marker assisted pyramiding of two disease resistance genes. Note that homozygotes can be selected from the F2 population. One of the most intuitive stages to use markers to select plants is at an early generation (especially F2 or F3). The main advantage is that many plants with unwanted gene combinations, especially those that lack essential disease resistance traits and plant height, can be simply discarded. This has important consequences in the later stages of the breeding program because the evaluation for other traits can be more efficiently and cheaply designed for fewer breeding lines (especially in terms of field space). discarded in an early generation which permits the evaluation of fewer lines in later generations. The initial cost of using markers is more expensive compared to conventional breeding, but is it worth the investment? There are many barriers to the adoption of MAS in plant breeding. Currently, one of the most important barriers for MAS in rice today is the prohibitive cost. Although there are only a small number of reports analyzing the economics of MAS versus conventional breeding in the literature, the cost-effectiveness of using MAS compared to conventional plant breeding varies considerably between studies. (2) there is a large initial cost in the development of markers which is seldom reported. For marker assisted backcrossing, the initial cost of using markers would be more expensive compared to conventional breeding in the short term however time savings could lead to an accelerated variety release which could translate into greater profits in the medium to long term. Another important factor obstructing the successful application of markers for line development is the low reliability of markers to determine phenotype. This is often attributable to the �thoroughness� of the primary QTL mapping study. Even QTLs that are detected with high LOD scores and explain a large proportion of the phenotype may be affected by sampling bias (especially in small populations), and therefore may not be useful for MAS. Furthermore, the effect of a QTL may depend on the genetic background. This emphasizes the importance of testing the QTL effects and the reliability of markers (i.e. QTL/marker validation) before MAS is undertaken. Finally the level of integration between molecular geneticists and plant breeders (and scientists from other disciplines) may not be adequate to ensure that markers are effectively applied for line development. We believe that despite the relatively small adoption of markers in rice breeding to date, there will be a greater level of adoption within the next decade and beyond. available resource for generating new markers from DNA sequence data arising from rice genome sequencing and research in functional genomics. It is also critical that future endeavours in MAS are based upon lessons that have been learnt from past successes and (especially) failures in using MAS. Further optimization of marker genotyping methods in terms of cost-effectiveness and a greater level of integration between molecular and conventional breeding (especially in designing efficient and cost-effective strategies) represent the main challenges for the greater adoption and impact of MAS on rice breeding in the near future. Click here to see a list of suggested reading to learn more about marker assisted breeding. In the next lesson, you will learn more on QTL mapping.